Agia Roumeli is a small and secluded village on the south coast of Chania prefecture, between Chora Sfakion and Sougia. It lies at the end of the Samaria Gorge and is visited by thousands of people who descend the gorge every day. 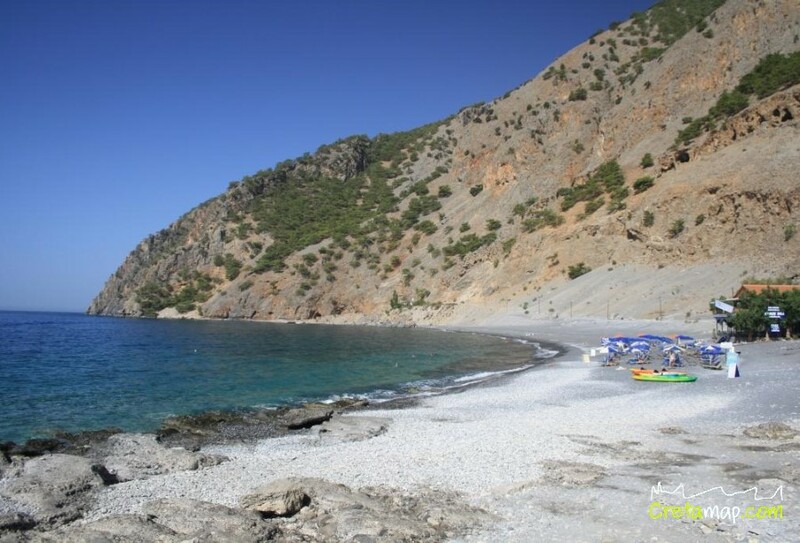 The waters in Agia Roumeli are crystal clear and the beach is long and ideal for snorkeling. Showers, umbrellas and sunbeds, cafe, snack, tavernas, accommodation, mini market, ferry boat trips. The main beach is well organised but the more you distance yourself, the more likely it is you will be alone in a deserted little beach , with caves or large rocks offering shade and suitable for nudism. * The main beach is crowded with hikers until the departure of the ferry. As is there is no road network in Agia Roumeli, access is possible only by the ferry from Chora Sfakion, Palaeochora, Sougia and Loutro and on foot by either crossing the Samaria gorge or following the E4 path from Chora Sfakion which takes about 7 hours.